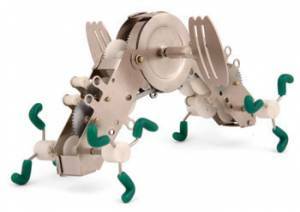 Kikkerland Le Pinch Articulated Wind Up Toy. Le Pinch is the evolutionary pinnacle of our fun Kritterium universe. Having unfolded from Awika and Bonga, Le Pinch is very articulated, even a little complicated, however in no time flat you will find out that Le Pinch is very manageable, and quite flexible. and wind him all the way. Colours are assorted, sorry, we don't offer a colour choice and are picked based on availability. Design by Chico Bicalho, Brazil. Size: 5.5 X 3 x 3 inches.